Plain language, clear explanations, and a focus on practical business applications. A recent A. T. Kearny study found that information technology is the number-one item on the agendas of a majority of CEOs and boards of directors. However, while senior managers are spending more time keeping abreast of developments in IT, many remain uncomfortable making decisions concerning technology issues that they don't entirely grasp. The future belongs to organizations with the knowledge and confidence to exploit their IT resources wisely and use them aggressively. 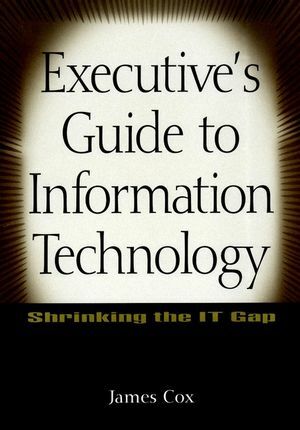 Executive's Guide to Information Technology gives business leaders the tools they need to do both. In a business environment increasingly driven by information technology, it is essential for top-level executives to keep abreast of the latest developments in IT. They must understand how information systems can help achieve business goals and be able to use this understanding to make critical business decisions. Unfortunately, many senior-level executives find themselves at the mercy of technicians who have little grasp of business issues, focus on details rather than broader functions, and speak an arcane and mystifying language. There is a clear need for an intermediary to help executives decipher technological language, seek and get the answers that are most important from a business perspective, and develop better working relationships with IT personnel. Executive's Guide to Information Technology provides a "Rosetta stone" that makes sense of a seemingly chaotic cluster of components-a coherent, trustworthy frame of reference that lays the foundation for more effective working relationships among business executives and technology managers. This book helps executives ask better questions about IT issues and better understand the answers they receive. Using integrated models that illustrate how information technologies form an infrastructure that supports practical business uses of information, it keeps the discussion focused on matters of direct concern to executives. Understanding these models develops a stronger grasp of the evolving role IT plays within organizations and establishes a comfort zone within which managers can develop a keener comprehension of component technologies and the strategic and tactical business decisions that surround them. Whether it is read from cover to cover or consulted as a quick reference, Executive's Guide to Information Technology is an indispensable tool for CEOs, board members, COOs, CFOs, controllers, treasurers, and other business professionals who need to establish firm control of the governance, direction, and management of two of their most valuable assets: information and the technologies that support it. JAMES COX is President, principal executive, and owner of jcoxcorp, inc, which is incorporated under the laws of the State of California. He has over twenty years of experience in sales, sales management, and marketing in high-technology companies, beginning with business minicomputer sales at Qantel in 1977. He was vice president of sales and marketing for a leading VAR and systems integrator that sold and implemented some of the first commercial Unix and relational database platforms during the early 1980s. He later worked with several commercial Unix vendors and was western operations manager for client/server sales for Prime Computer. He established a consulting practice in 1989 and incorporated the company in 1995. Mr. Cox received his bachelor's and master's degrees from the University of Texas and the University of North Texas respectively, and completed his doctoral work at the University of Texas in Austin, where he also taught for five years before entering computer sales in 1977. He has authored several articles and served in a number of editorial positions, and is currently researching and writing a book on the asset value of information in knowledge-based companies.